These weights bear no relation to the relative importance of these taxes to business, as the figure below shows. The individual income tax is almost a third of the SBTCI total, while it accounts for only about 6 percent of total state and local taxes on business in the average state, according to the Ernst & Young/COST average tax study, which is based on actual tax revenues as reported in the U.S. Census Bureau’s State and Local Government Finances series.1 Property taxes, on the other hand, count for only 15 percent of the SBTCI even though the COST report finds that they make up 43 percent of the taxes businesses pay. Source: Tax Foundation, 2017 State Business Tax Climate Index, September, 2016, and Council on State Taxation, Total State and Local Business Taxes: State-by-state Estimates for Fiscal Year 2015, December 2016. To understand how the Tax Foundation’s weights affect the outcome of the index, we took each state’s SBTCI score for each of the five components and then produced an overall score using COST’s weightings instead of the Tax Foundation’s weights. The differences are striking; 15 states’ rankings changed by 10 or more positions including five whose rank changed by 20 or more positions. For example, Washington fell from 12th to 32nd, Texas from 10th to 31st, while New Mexico rose from 35th to 18th and Ohio from 42nd to 22nd. Additionally, the Tax Foundation approach means the index weights change from one year to the next. This makes it difficult to know whether a state’s change in rank was due to changes in policy or just changes in the weights given to the five components. If the SBTCI scores for 2016 were re-weighted using the 2011 weights, for example, 32 of the 50 states would have seen a change in rank. This illustrates just one problem with the index number approach to ranking states: combining dozens of diverse measures, and then scaling and weighting them, leads to an index that has little meaning or consistency. If one simply measured the total taxes paid, these problems would disappear. But by using a weighted index number, the Tax Foundation can heavily penalize states with more progressive tax system, while concealing this objective. Each of the five components is a simple average of two sub-indexes, one related to tax rates and the other to the tax base. Each sub-index, in turn, is constructed from several measures.3 The varying number of measures in each sub-index results, however, in an apparently accidental variation in weights given the individual measures, as can be seen in the table above. The corporate income tax component is composed of two equally-weighted sub-indexes: the corporate tax rate index, and the corporate tax base index. According to the Tax Foundation, the latter two are intended to measure “the economic drag created by multiple-rate corporate income tax systems,” but it is unclear why multiple-rate systems would create an “economic drag.” The hypothesis that such trivial details as the number of tax brackets has a meaningful economic impact is not supported by evidence. Instead, the goal apparently is to punish states with progressive rate structures since flat income taxes have no brackets. If a state went from two brackets to none (a flat tax rate), it would automatically get the top score possible on two of the three measures. 1. The number of years allowed for carrying net operating losses backward and forward (more is considered better), with penalties for states that cap the amount of net operating losses carried backward or forward. Apportionment rules can also drastically alter tax liability. Consider a manufacturer that sells computers worldwide; in a state that taxes the corporation’s profits apportioned to the state only on the basis of sales within the state, only a tiny share of U.S. profits will be taxed, while a state that also takes payroll and property within the state into account might well tax a majority of the computer maker’s domestic profits.5 Amazingly, this issue appears nowhere in the SBTCI. Consider the combined effects of these features of the SBTCI on the ranking of a particular state like Iowa. While Iowa ranks among the states with the lowest corporate income taxes as a share of state GDP, the Tax Foundation says Iowa has the next-to-worst corporate tax system in the country. The reasons for this contradiction are several. Iowa allows a deduction for federal taxes and employs single-factor apportionment; both factors cause a major reduction in corporate tax liability but are excluded from the Tax Foundation’s index. On the other hand, Iowa offers all of the kinds of tax credits for which the Tax Foundation penalizes a state, further reducing tax liability but making its SBTCI worse. The combined effect of Iowa’s deductions, apportionment and tax credits is to leave some large and very profitable Iowa corporations with a negative tax liability year after year — they get millions in “refunds” instead of paying taxes. The individual income tax component is constructed similarly to the corporate income tax. It includes local income taxes, in the few states where these are allowed, as well as state income taxes. The individual income tax rate sub-index is all about penalizing states with progressive rate structures. To the Tax Foundation, no income tax at all is best. Second best is a low, flat rate. Factors 2, 3 and 4 all reward states according to how close their rate structure is to a flat rate: a small number of narrow tax brackets means the top tax bracket kicks in at a fairly low level so that most taxpayers find themselves in this one bracket. The worst thing a state can do, according to the Tax Foundation, is construct a really progressive income tax with broad brackets continuing into the upper reaches of income. Since a graduated income tax is the only progressive component of a state tax system, the Tax Foundation is penalizing states for attempting to mitigate the regressivity of sales and property taxes, which hit lower income people harder than wealthier people. Several of these factors also reflect a preference for lower taxes on higher income taxpayers. In particular, low or zero taxes on capital income and the absence of an alternative minimum tax reduce how much the very rich pay in taxes. Additionally, the weighting of the factors is quite arbitrary; the marriage penalty, for example, is one-third of the sub-index while the alternative minimum tax is only seven percent. 3. the existence and rate of excise taxes on motor fuels, tobacco, spirits and beer (all excise taxes are bad). The SBTCI sales tax component contains some glaring contradictions. According to the Tax Foundation, a sales tax on natural gas is a good thing, while a gasoline excise tax is bad. Excise taxes are bad, the Tax Foundation writes, because they drive consumers to shop in neighboring states for tobacco or alcohol, but a sales tax applied to food is good because it raises a lot of revenue, which means the state can get by with a lower overall sales tax rate. Based on this, it appears that the Tax Foundation believes that people who live near state lines don’t drive to neighboring states to buy food but do for alcohol, even though groceries are a much larger share of the household budget than alcohol, and that higher excise tax revenue, unlike sales tax revenue, does not enable a state to have a lower sales tax rate, even when both revenue sources flow into the general fund. The Tax Foundation seems completely undeterred by the fact that taxing groceries hits the middle-class and lower-income people hardest. Instead, it asserts that the exemption mostly benefits grocers, contradicting grocery chains which have been vocal opponents of taxing groceries. The Tax Foundation does not bother to explain how taxing groceries and services promotes economic development, nor do they mention how tiny a fraction of the state’s economy is border-city convenience stores and how small a loss they suffer when some fraction of the goods they sell are covered by excise taxes and some small amount of business is lost to a neighboring state with lower taxes. Despite all these peculiarities, the sales tax base comprises 10.75 percent of the total SBTCI (half of the sales tax index, which is weighted 21.5 percent), so it matters a lot in the overall ranking. The unemployment insurance (UI) component consists of two equally-weighted sub-indexes. The Tax Foundation here remains true to the overriding principle governing the SBTCI: lower taxes are better no matter what. The unemployment insurance tax component rewards states for lower UI tax rates regardless of the condition of the state’s UI trust fund. States with trust funds teetering towards insolvency would be rewarded with a higher ranking for pushing the UI trust fund over the brink by imprudently lowering taxes which would, of course, necessitate higher tax rates in the future. Given the wide variation in property tax practices and the inadequacy and inconsistencies in state property tax data, the first two measures – property tax collections per capita and as a percent of state personal income – are reasonable measures of the importance of property taxes in lieu of data on tax rates. But together they account for only 40 percent of the property tax index. The remaining 60 percent consists of a set of penalties applied to states that use various measures to tax wealthy individuals and businesses. Taxes on intangible property, estates, inheritances, and gifts in particular are highly progressive, falling mostly on the wealthiest households. Once again, the net effect is to reward states with low taxes and regressive tax systems. Property taxes are, of course, a legitimate part of a measure of the state’s business tax climate. Yet the property tax index here makes no attempt to sort out the business share of property taxes; taxes on residential property make up a major share of property tax revenue. Furthermore, half the index is based mostly on various wealth taxes and other taxes falling primarily on individuals. Only the capital stock tax and the inventory tax are clearly solely business taxes. 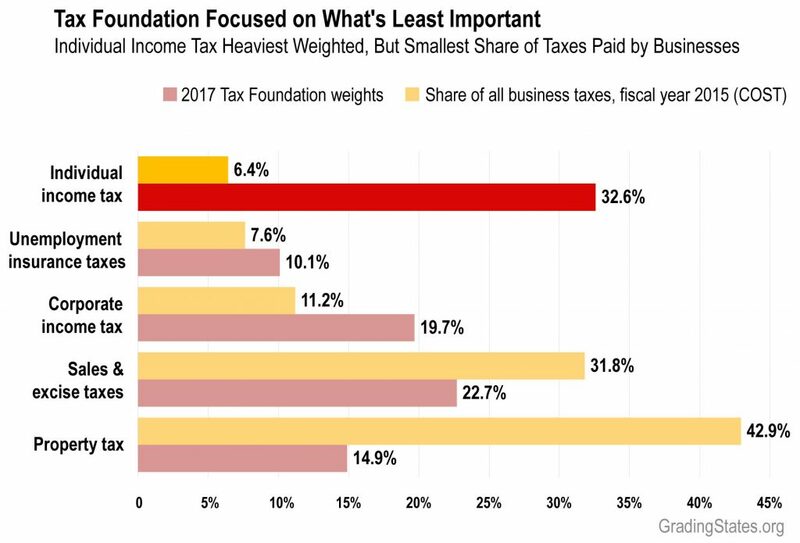 The Tax Foundation makes little attempt to provide a rationale for inserting personal wealth and property taxes into a business climate ranking, even though these account for a majority of the overall property tax index. 3. Where the measures are continuous variables such as tax rates, they are re-scaled such that the lowest rate is given a value of 10 (the best score) and the highest rate a value of 0 (the worst score). A tax rate that is, say, 80 percent of the highest rate, would have a score of 2; a rate that is halfway between the highest and lowest rates would have a score of 5. Where the measures are 0-1 variables (1 if the state has a positive tax feature, 0 if it does not), these 0-1 variables are weighted 20 percent in the sub-index total, the scalar variables 80 percent. 4. The measure “Deductibility of taxes paid” in the 2013 edition describes only the deduction for taxes paid to “foreign taxing authorities,” allowed in 21 states. Only 5 states allow the deduction for taxes paid to the federal government, which are not mentioned anywhere in the corporate tax index. 5. The computer maker might have all of its production facilities in one state, for example, but sell in all 50 states, with only, say, two percent of its sales going to the home state. If the home state used single sales factor apportionment, only two percent of the corporation’s profits would be apportioned to and taxed by the home state. If, on the other hand, the home state used three-factor apportionment (payroll, property and sales), over two-thirds of its profits would be taxed.